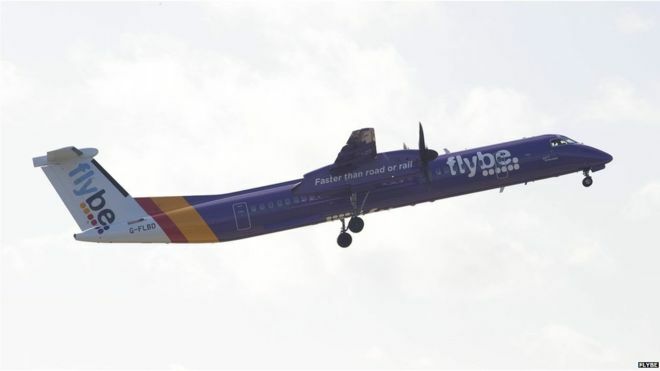 The regional airline Flybe has announced pre-tax annual profits of £2.7m compared with a loss of £35.6m the previous year. Over the year the company launched 52 new routes, which helped boost passenger numbers by 5.9%. The rise came despite terrorist attacks in Paris in November and in Brussels in March, which made travellers cautious. Flybe’s chief executive, Saad Hammad, said lower oil prices had saved the company about £11m. Group revenue increased by 8.7% to £624m, compared to £574m in the last financial year. However, in its annual results statement the company said conditions remained “challenging”. It said trading conditions had been hit by industrial unrest in France and increased competition in the European market for shorter flights. Flybe also said there was some consumer uncertainty – fuelled in part by anxiety ahead of the UK referendum on membership of the European Union. Mr Hammad, who is steering the company through a three year turnaround plan said: “We delivered top-line growth in a difficult revenue environment, expanding our network and carrying more passengers than last year.” He also said that costs other than fuel had been cut. Mr Hammad has been reorganising the company’s fleet of jets, so that they eventually own, rather than lease, 50% of their aircraft. The company says that will bring cost savings and greater flexibility. “As a result of all the action we have taken, Flybe is now a much more resilient business and well positioned for profitable growth,” Mr Hammad added.